The first of the Army's designated VTOL research aircraft was a continuation of the work to develop a 'flying platform'. 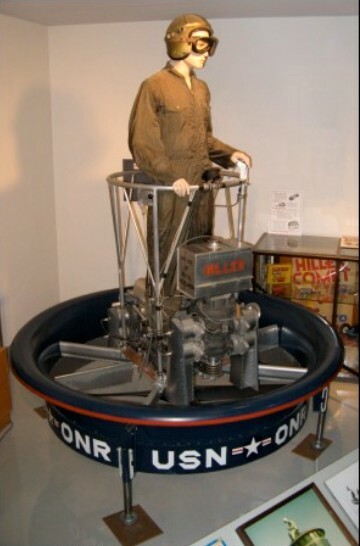 The idea for a machine of this kind, making use of kinesthetic control (in which the pilot leans in the direction he wishes to go) is attributed to Charles H. Zimmerman and dates back to 1940. In the early 1950s, N.A.C.A. (the forerunner of N.A.S.A.) undertook a research programme at Langley Laboratory to prove the idea. Three types of aircraft were studied, each capable of carrying one man who stood on a platform, and supported, respectively, by a rotor, a ducted fan and com-pressed air. 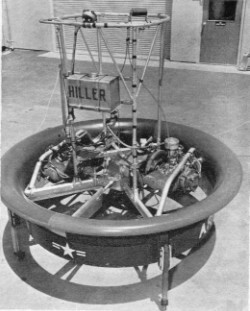 Subsequently, the Army placed contracts for further development of a rotor-type flying platform by de Lackner (the Aerocycle) and of the ducted fan type by Hiller. The Hiller Helicopter Company had by this time already completed some studies in conjunction with Charles Zimmerman, in 1947, but no free flights were then achieved. A contract was placed with the company in 1953 for the construction of a prototype under Office of Naval Research supervision and this flying platform achieved its first successful untethered flight in February 1955. The Pawnee featured a pair of contra-rotating rotors spinning inside a duct with a diameter of 1.5 meters (5 feet). Each rotor was driven by its own 30 kW (40 HP) two-stroke engine. The pilot stood above the duct, surrounded by a circular handrail and protected by a safety harness. He controlled the engines with a twist-grip throttle and leaned to guide the aircraft. The duct improved safety during takeoff and landing. The duct also provided additional lift, since there was a horizontal "lip" around its top edge that curved down into the duct. The airflow into the duct resulted in low air pressure above the lip, and the pressure difference between the top and bottom of the lip generated a net upward force, providing as much as 40% of the total lift of the aircraft. In practice, speeds of up to 15 m.p.h. were achieved. Hand controls included the throttles to control vertical movement and a control to apply power differentially to the two propellers in order to keep the platform headed in the right direction. The Pawnee handled very well in flight tests. The machine was then modified with longer landing gear legs to increase ground clearance, and eight vanes were mounted underneath the duct to improve flight control. 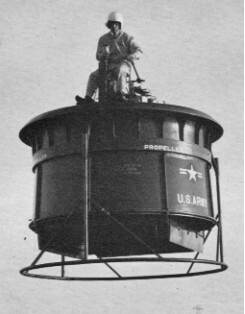 Results of the trials with their early platform were sufficiently promising for the Army to award Hiller a second contract, in 1956, for two larger examples of the flying platform. These were designated W- I E (serials 56-6944 and 56-6945). In the W-1E, the diameter of the duct was increased to 8 ft. and the chord was more than doubled. Three interconnected 30 kW (40 HP) Nelson H-56 engines supplied power to the counter-rotating propellers. Controls were modified to be similar to those in a helicopter and the pilot had a rudimentary seat. First flight of the W-1E (56-6944) was made on February 4th, 1955. It was delivered to the Army in 1959 but no further development occurred.